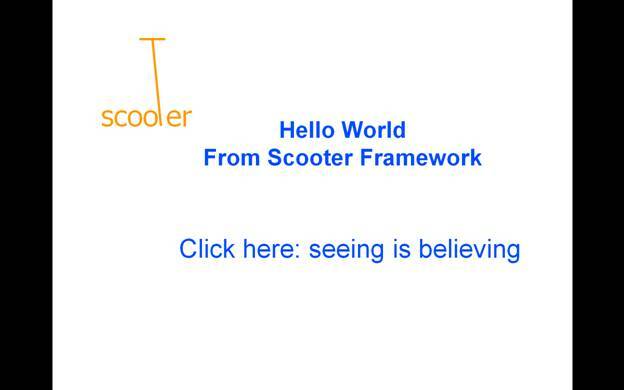 ﻿ Scooter Framework - Welcome! Java web application development can be simple, fast and fun! Yes! You can build a database-backed web application in Java in only three steps. By typing an extra 5 characters in step 2, you can make this a single-page AJAX CRUD app. No more tedious compile, deploy, shutdown, and restart. Just edit/save your Java code, and refresh your browser. No turnaround. Note: all screencasts can be downloaded from here. December 17, 2010: AJAX-backed, wiki-powered TODO list app in 2 minutes. See details. December 10, 2010: Scooter1.0 is released, featuring Ajax app generation, File Browser, simplified app creation, rendering APIs, 50+ flexible static Active Record APIs and more. 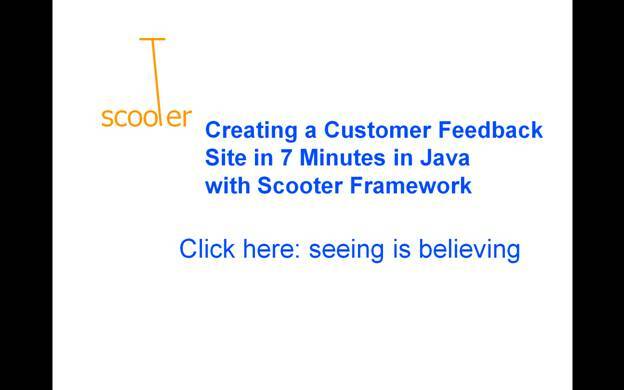 Scooter framework is a highly-productive, full-stack pure Java web framework. Scooter brings you Rails-like simplicity and dynamism in J2EE development. Scooter allows you to dynamically build an app without learning script languages. See how simple it is to say "Hello World"
How many lines of Java code to write a Twitter-like app? 173!